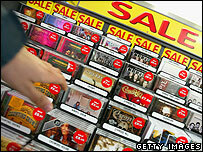 BBC NEWS | UK | Magazine | Are free CDs killing music? Are free CDs killing music? Prince has sparked an outcry by giving away his new album in the Mail on Sunday. Many weekend newspapers are now sold with a CD or film enclosed. Forget downloads, are free CDs killing music? Freebies fill the newspaper and magazine racks in such abundance it's possible to get kitted out for the summer on this week's pickings. As well as the usual array of DVDs and CDs, there are sunglasses, flip-flops, "designer bangles" and for those looking for a change of image, a superhero Thing face mask. The giveaway, or covermount as it is known in the trade, is now big business, but on Sunday the market experiences a fresh twist. Nestling under cellophane wrapped around the Mail on Sunday, Prince's Planet Earth CD will become the first new studio album to be given away. For Prince fans not seeing him in concert at the O2, where the album will also be distributed for free, paying £1.40 for the newspaper will be the only way to get the album. The Mail on Sunday says the deal - which earns Prince an undisclosed fee - is all about giving music to the masses and free CDs usually increase sales for the artist. But the shops are outraged and predict that music lovers will lose out. Although covermounts have for years been a major concern to the Entertainment Retailers Association, its director general Kim Bayley says this marks a new low. "It devalues the music and the losers will be new artists who are trying to come through who won't have any support from recording companies because established artists are chucking out their music for free. "Consumers only have so much listening time in the week and if they receive the new album from Prince then they don't need to buy new music and will spend their money on something else." Giving away something for free gives the impression it has no value, says Ms Bayley, and along with illegal downloads, they reinforce consumer expectations that music costs next to nothing. But the free CD has been around for decades. Smash Hits gave away flexi-discs in the 1980s and modern music magazines such as NME, Mojo and The Word have long been including CD compilations with their issues. It was recently estimated that 10% of CDs produced in the UK are covermounts. But most of these are to plug new artists and therefore have the blessing of the industry, because fledgling acts reach new audiences. There are fears, however, that the Prince deal marks a new phase in which established artists will cut record companies and traditional retailers out of the equation. It comes at a time when shops like HMV are feeling the pinch. Its profits have halved in a year, in a climate where CD sales are falling and prices have come down by about 50% in recent years. But it will stock the Mail on Sunday this weekend. If this deal works for Prince - and it wouldn't for new or successful artists - then it could mean the end for music retailers reeling from the effect of internet shopping, says John Aizlewood, a music critic and broadcaster. "People are growing up thinking music is a cheaply available thing," he says. "Downloading is a less pleasant experience than a CD but when CDs came out they said that about vinyl, partly because of the glorious cover art. "Maybe it's the march of history that the retailers just can't stop. We have 15 and 16-year-old kids finding music is easily available and there's no yearning for something that they've never had." But he warned that while the giveaway can stimulate interest in an artist, it can also cheapen music because the CDs often have poor quality content on them. The promise of a "history of punk" CD, for example, may turn out to be no more than some rubbish live tracks from second-rate bands. One of the reasons why Q Magazine last year radically reduced the frequency with which it gave away free CDs was because bosses felt it was cheapening the product. "The last thing we want is people saying 'free magazine with CD', says Q's managing director Stuart Williams. "That's probably what happened with Smash Hits and Top of the Pops magazine. It became more about what we stuck on the front cover rather than the front cover itself. We want these CDs to be something they put in their music collection, not throw away." Another major factor was the cost. In 1997, Q's first free CD - a high quality, best of the year - increased sales of the magazine by 325%, and the production cost was shared by the record company. But the returns have fallen since and the cost is now £150,000, fully absorbed by the magazine. But Mr Williams believes the Prince deal is a one-off with no consequences for anyone else. "Prince gave up on the industry a decade ago and was walking around with 'slavery' written on his face. He's made his millions so all he cares about now is getting his music out to as many people as possible. "He's not trying to make money out of this. If he could drop them out of a helicopter over London, he would do." The woes of the music industry have nothing to do with covermounts and everything to do with free downloads, says Mr Williams. Albums are no longer the earner they once were, he says, as demonstrated by artists like Radiohead threatening to no longer use the format. The broader issue of the Prince deal is how the function of albums has changed, says Mark Ellen, editor of The Word magazine. "Five years ago people toured in order to sell records and called the name of their tour after their recording, and probably lost money in order to promote and extend the life of the album. "That balance has shifted and now people put out albums to justify going on tour and charging more to go on tour. " As Prince might say, a sign o' the times. After getting robbed by record shops for many years, it's about time we got a better deal. As a teenager, I had to pay £16-£18 per CD when they came out. I could rarely afford to buy what I wanted. HMV and the likes are just complaining now their monopoly is over. The free music CD's given away by the Guardian from time to time have introduced me to 4 or 5 bands I would probably never heard of. As a result I've gone on to buy their albums. Seems a good idea to me. The article regarding the free CD is quite interesting as the only people really complaining are the record industry middle men and the shops that are making a hefty commission. Prince is in a position to shun the industry and clearly over the last few years his mammoth touring has generated more revenue than CD sales- which could be considered a more honest way to make money. He is one of the hardest working musicians in the industry today and is only charging £31.21 for tickets (unheard of for a musician of his calibre). The argument for supporting new artists is a poor one and has little validity in the modern world. Goodbye to the Pimps of the Old Music World! I like covermount CDs. I can listen to artists I wouldn't normally listen to and if they are any good I may go and by other CDs or download other stuff by such artists. But I'm not sure I'd buy the 'Mail on Sunday' even if it had a really good covermount CD. There are so many factors affecting the bloated, uncaring record industry that simply blaming a free CD or two seems ludicrous to me. The idea of consumers having a "limited listening time" each week is also laughable at best, and I can only see the large music retailers feeling the pinch. Top of The Pops is dead, people have so many more avenues to explore new music and thus the reliance on high-street stores to sell the latest hits is severely diminished. Do we really need global-mega-stars?? Long live the independent music lover! Well said Geoff Gillespie, these companies are the sane ones who've been happy to rip off the British music consumer for years with overly inflated CD prices. If Prince chooses to release his album through a tie in with a paper more power to him, if he as the owner of the music is happy to do so then nobody can complain. It is interesting to see once again the assumption that the British consumer is a halfwit and relies on free giveaway's to fill their record collections. I have 1000's of CD's, vinyl and I download music as well for one reason and one reason only I like the music. You only have to look at the incredibly diverse British music scene to know all these arguments are redundant. Come on, the majority of the tabloid 'freebie' CDs are stuffed to the gunnells with live versions of hits that can't compare with the mastered versions in the shops. I've given up being wooed by claims of a compilation of the 'best hits' as I have rarely found a track worthy of holding on to. Free CDs with newspapers, downloading songs and music videos etc. do threaten to cut the profits enjoyed by record companies and artists. However, as a lot of revenue in music is created through building up a fanbase who regularly buy albums and attend concerts, it just means that the focus is shifting slightly towards generating revenue more broadly than by simply releasing a single. I think its a great shift. The record companies have priced themselves out of the market. The cost of an album or single is insane. Music is an art form and is meant to be enjoyed by as many as possible. That's why I support all those who release their music under the Creative Commons License as well as everyone else who is bypassing the record companies control. Maybe freebies and downloads are "killing" music, but they're certainly killing record shops. In the "good old days" you bought an album and received everything that was contained on that album good and bad. Nowadays you can buy the individual tracks, omitting the ones you don't like. To me, this is like buying a book and tearing out the chapters you don't like or slicing a painting into bits because you don't like certain bits of it. Surely the album (not compilations)was meant as a whole piece of work? Just like a novel or painting? Or am I too old fashioned. I think what people are missing is that there is a two tier music industry - the mainstream and the underground, each with very different self-defining characteristics. However, aside from the clear difference in intention and sound, the key defining element is the amount of funding available to market the respective releases. The kind of people who are into progressive, genre defining music will not be dictated to in the same way as the mainstream consumers, who effectively buy (or listen to) what they are told to. Consequently, real music lovers will continue to dig in crates, read real music magazines and search on A&R portals like boredofmusic.com and carbonlogic.co.uk, principally because they have no choice - it is their passion! Let the mainstream be manipulated, who knows - maybe real music will have room to manoeuvre properly again! As the co-owner of an independent record label, I wholly welcome the death of the traditional music retailer. It can't come quick enough for me, and the people who matter in all of this - the artist / label and the consumer - can get on with the business of selling music on line without the need for someone in the middle taking a huge chunk out of the profits. The major chains have everything on 100% sale or return, meaning if they don't sell it they can return it. They hike the prices up and do little or nothing at all to promote new bands. Good riddance to the lot of them! I don't buy the criticism that established artists giving away their music will harm new and up-and-coming bands. In fact, I'm more likely to think 'Great, I didn't have to fork out for that successful, household name band's new album so I now have £10 spare to get the new CD from that new band I'm hearing about'. I never bother looking at free CDs from papers - they're a poor way of trying to catch the 'swing-reader' and papers are already stuffed too full of cotton wool and junk these days as it is (whatever happened to real news?) I'll buy Prince's CD the usual way - from a proper music shop. Sure it costs money that way, but music has soul. Getting free bits of plastic from a newspaper is just selling out to the worst form of capitalism - fall for that honey trap and music will have genuinely lost its soul. Keep it real! "Consumers only have so much listening time in the week and if they receive the new album from Prince then they don't need to buy new music and will spend their money on something else." This is complete rubbish. People listen to what they like to listen to. If I received the free CD, but didn't like Prince, I wouldn't listen to it. Who really cares if there is a shift in balance on who makes money? Music artists whether good or bad (as long as they are well known) have been making too much easy money for too long, as have the record companies. They are only whinging because their share of the pie is smaller.